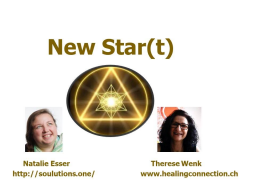 A few hours before the webinar is taking place there is a special New Moon and Solar Eclipse taking place, that is setting the energetic tone for the next 6 month and also giving an idea what direction we will take for the next 18 month globally and personally. There are some really beautiful astrological constellations in the sky at the moment, that make it very easy for us to come into contact with our own true being. It´s a great time to pay attention to the voice of our Soul and give intention where we wanna go, how we want to feel and live and what we want to experience now. You do not need any astrological knowledge to join the webinar, this is just an explanation so you can see why we choose this date for the webinar. Therese Wenk and I are both energetically working via the quantum field and simply using these energies to your advantage, as they are very helpful for people to get into contact with their core and to go into a direction that is in alignment with their Souls mission. I will explain a little bit about the energetics in the webinar, but the main work will take place without words, as we will work with energetic frequencies, to be your quantum assistance for your New Star(t). We all need a clean plate and new beginning from time to time and this time actually is just perfect if you want to have a fresh start, following your own inner guiding light. If you can´t make it at the scheduled time you can sign in anyway and listen to the replay whenever you want and as often as you want, it is included in the fee. To prepare for the webinar, just make sure you will not be disturbed and if you want you can visualize the six pointed star, that you can see on the picture. This shape of the double triangle is formed by the astrological constellations at the moment and happens to be also the form of your Merkaba. As above, so below. As within, so without. Follow you Inner Star, mirrowed in the heavens.